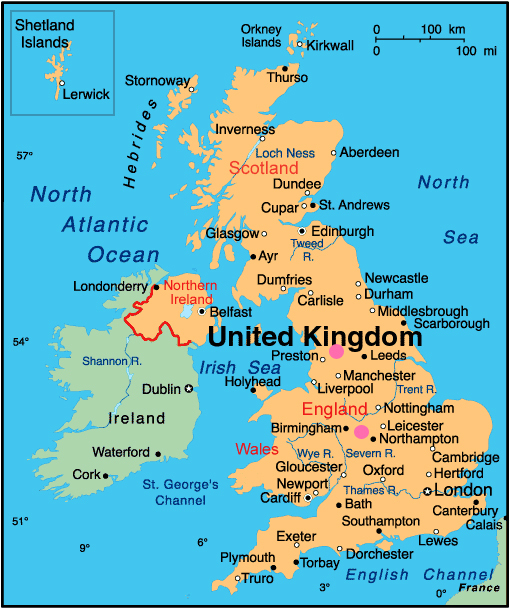 If uou click on this map of the United Kingdom, you can see two small pink circles which, very roughly, mark the centre of Great Britain (including its 401 islands) and the centre of England. If someone asked you where the centre of Great Britain was or for that matter where the centre of England was, would you know? Or more to the point would you care? The centre of Britain must obviously be further north than the centre of England, as Britain includes Scotland, of which there is quite a lot. And the centre of Britain is likely to be further west than the centre of England because of Wales. Northern Ireland is not included in the centre of Great Britain as the country we are part of is the United Kingdom of Great Britain and Northern Ireland, that is Great Britain doesn’t include Northern Ireland. Well to add to the other obscure geographical posts that I have written previously, here are some answers. The weathered stones of an outcrop of Millstone Grit called Whitendale Hanging Stones north of Dunsop Bridge. The wooden post marks the exact centre of Great Britain. The nearest village to the geographical centre of Britain (including its 401 islands) was officially recognised by the Ordnance Survey in 1992 as being Dunsop Bridge in the Forest of Bowland near Clitheroe in Lancashire. 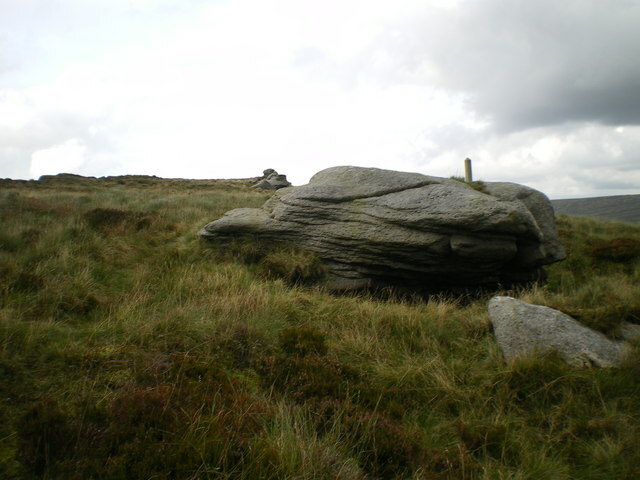 However in 2002, the Ordnance Survey calculated that the exact point is at Whitendale Hanging Stones (grid reference SD 64188 56541), near Brennand Farm, 4½ miles north of Dunsop Bridge. The measurement calculates the point at which a two-dimensional object – think of a cardboard cut-out of Great Britain – would balance horizontally on the head of a theoretical pin, that is its centre of gravity. 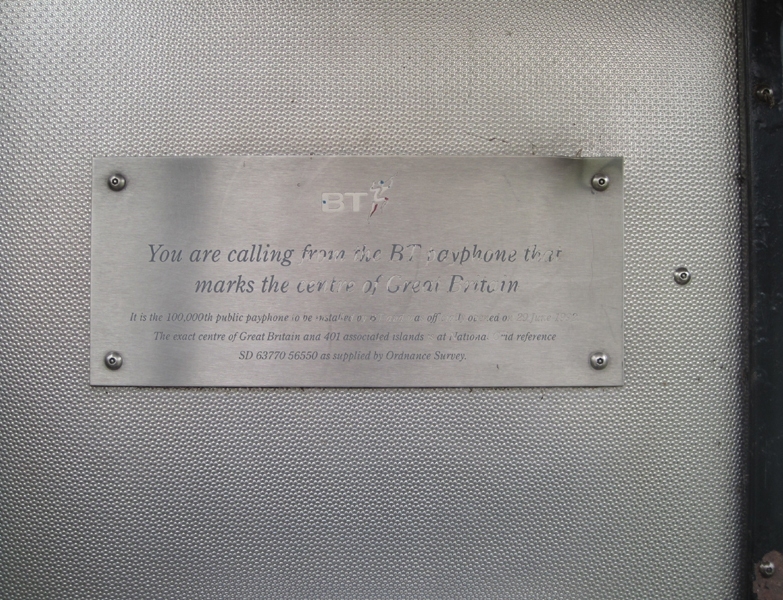 The plaque in the BT phone box in Dunsop Bridge that marks the centre of Great Britain. BT also installed its 100,000th payphone at Dunsop Bridge (not by coincidence surely?) and included a plaque to explain its significance. The plaque reads ‘You are calling from the BT payphone that marks the centre of Great Britain.’ The telephone box was unveiled by the explorer and writer Sir Ranulph Fiennes. The geographical centre of England was calculated by the Ordnance Survey in 2002, again by finding the centre point of the two-dimensional shape made by England. It is in a field close to Lindley Hall Farm near Fenny Drayton in Leicestershire (grid reference SP 36373 96143). A post next to a hedge in a field of Lindley Hall Farm near Fenny Drayton points to the exact centre of England. 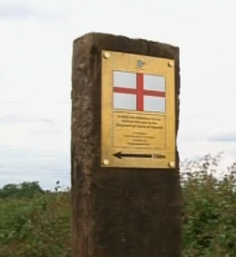 In June 2013, a 6ft high ‘monument’ made from a railway sleeper was erected on the side of the field with a sign pointing to the exact point, 492ft into the field. According to a BBC report at the time, the owner of the farm, Stephen Farmer, said it could become a tourist attraction in future, explaining that ‘It’s a position on the map, the same as Land’s End [and] John O’Groats. People go to see their marks and have their photos taken so I think it wants to be known to the public, where it is.’ As the field and the path to it are privately owned, Mr Farmer will presumably have to allow public access to the monument if he wants to put it on the map. Incidentally Dunsop Bridge is roughly 95 miles north-north-west of Fenny Drayton. Some people argue that the furthest point from the sea should be considered the centre of Britain. The Ordnance Survey has found this point is just east of Church Flatts Farm, about a mile south-east of Coton-in-the-Elms, Derbyshire. Haltwhistle in Northumberland also claims, less convincingly, to be the centre of Britain based around it being on the mid-point of the longest line of longitude (the vertical line) on the mainland of Britain. The town even has a Centre of Britain Hotel!